Bold and colourful cover art can instantly sell a book to you and this is definitely one of the first staple lessons any would-be children's book author or illustrator should have drummed into them. 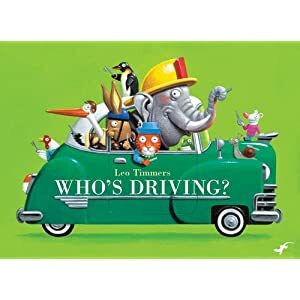 In the case of Leo Timmer's excellent little "discovery" book "Who's Driving", the cover is so eye catching and colourful that you can't help but pick it up and dive in. Following a series of superb animal characters through the story to find out who will drive each vehicle in turn is tons of fun. Toddlers will enjoy trying to work out who will drive the fire engine, who will fly the plane, who will cruise in the limousine or who will chug in the jeep. Timmers' illustrations are sublime and retro, the text is simple and engaging and there are tons of character and detail in each of the animals in the story. Great stuff. Oh dear. Charlotte spotted this book amongst the others at the library, and try as I might to dissuade her from taking it out, we ended up with this book in our week's haul of six others. 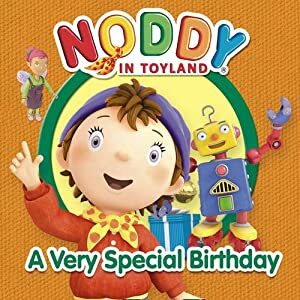 Those of you unfamiliar with Chorion's Noddy series on TV, pepped up and rebooted with shiny new CGI, might want to stop reading now and just cherish the memories of Enid Blyton's original books. Those who like the new stuff might also want to stop reading because something very odd seems to have happened with this book. Half of the characters in it are as you'd remember them from the TV series. The other half have been sweetened up, made less menacing (particularly in the case of the naughty goblins) and are completely unrecognisable. The throwaway story (about a robot's lack of birthday, and a mean trick played by the Goblins to try and spoil his birthday surprises for him) definitely wasn't written by Enid Blyton though her name certainly gets credited with it. Saccharin and ersatz. If you're lucky enough to spot any of the original books at car boot sales grab them instead. Even if your toddlers are fans of the Channel 5 / Chorion TV series, this isn't really worth bothering with. Not really a dog person but after several recommendations to read the Hairy Maclary books, we thought we'd pick one up from our local library. 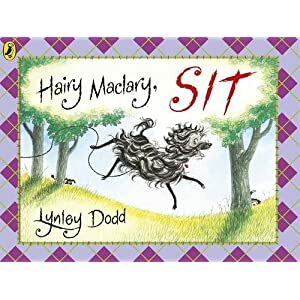 Hairy Maclary, SIT is the tale of the scruffy little scottie dog's first obedience class. Hairy Maclary and his friends soon run rings round the exasperated class leader, and the bouncy rhyming singsong narrative drives this busy story along perfectly. We're aiming to check out Lynley Dodd's other books about the wayward moggy Slinky Malinkie next. Any parents with restless toddlers will instantly identify with this little tale of a little bear who won't stay put when put to bed. 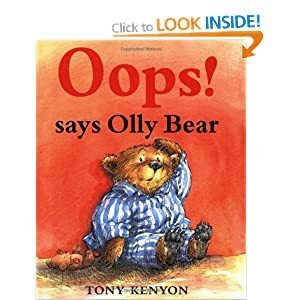 Olly the Bear can't sleep, wants a drink, wants to go to the toilet and so we follow his story as his bumps and scrapes keep his mummy and daddy awake all night. Of course, what you don't see in the book is Olly's mummy and daddy waking up at 6 the next morning with bags under their eyes you could carry a week's groceries in, but this is a children's book so perhaps reading this to your little ones at bedtime might make them snuggle down and drop off. Or want cake. One of the two. Daddy's favourite bit: The complete inaccuracy of "Daddy" being the one who tries to ignore Olly's noises and bumps by shrugging them off as "nothing"
An ordinary day, an ordinary girl, an ordinary walk with her ordinary dog. 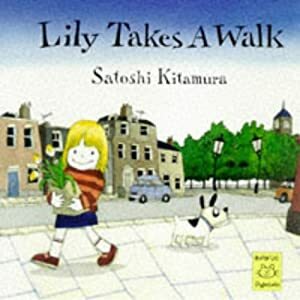 Or at least that's how it seems in Satoshi Kitamura's simple but engaging book. The devil is in the detail though, and in each illustration there's something extraordinary to see. Great artwork, but probably could've done with being a bit longer. An absolutely bonkers, crazy and chaotic tale (which is actually true, by the way, well sort of). Allan Ahlberg's tale tells of a young boy named Banjo Cannon who spends an eventful day chasing his dinner around the local park. 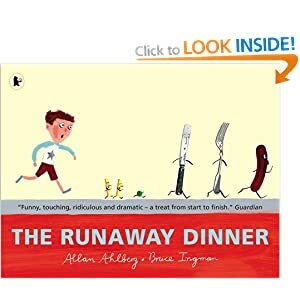 The flow of the text is as higgledypiggledy as the artwork by Bruce Ingman (who, like Picasso, must've spent a lifetime working out how to draw like a child and he's nailed it perfectly) but it's a thoroughly enjoyable book that should appeal to sausage lovers everywhere. Daddy's favourite bit: The Wimpy Bar / Greasy Spoon Cafe-type ketchup bottle that is on Banjo's table. 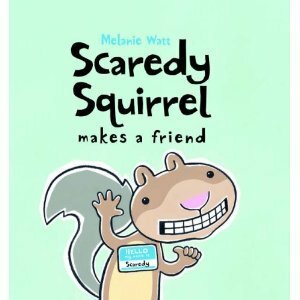 Scaredy Squirrel offers another self-help guide for nervous types - this time he deals with the trials and tribulations of making a new friend. Spotting a goldfish as a potential new pal, Scaredy makes sure and doubly sure that everything is in place before executing "Operation: Make a friend". Melanie Watt is ace. Great graphical drawing style, hilarious writing style and she's Canadian so I'm automatically duty-bound to think she's awesome. 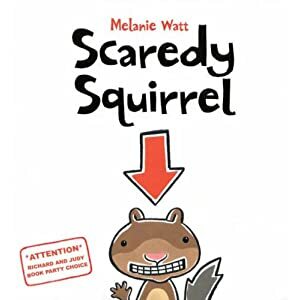 Scaredy Squirrel is a great character too so if your kids enjoyed Scaredy Squirrel's first forays from his ancient oak tree home, enjoy another chapter where things don't quite run according to Scaredy's meticulously constructed plans. Charlotte's best bit: "Licky dog!" Daddy's favourite bit: Any book that features a cameo appearance from Godzilla automatically gets 5 out of 5! Hmmmmm! Not sure what to make of this book. On the one hand it has a life lesson about not being scared of the dark contained within its pages. On the other hand it's a pretty menacing (and sometimes scary) book, and certainly not one you'd want to read to a restless toddler before bedtime. As you can see from the cover art, you're never really sure whether "The Bear under the Stairs" is a benign soul or a menacingly dark figure. 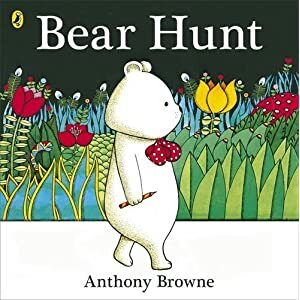 The little lad in the story is scared of the bear, and the space under the stairs and it would be extremely easy for your little ones to develop the same fear if you've got an understairs cupboard that's dark and dingy. 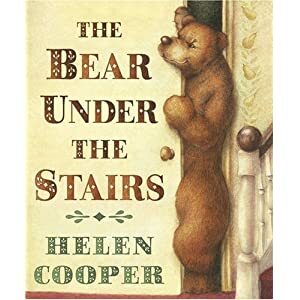 Maybe it's a worry-wort parent thing but Helen Cooper's book doesn't have a nice light "oh everything's alright then" ending, rather it seems to want to perpetuate the idea that this bear could be anywhere, under any stairs, at any time. Number one rule of kids books: Think about the psychological effect of your book and its characters on young and imaginative minds. Mr Pod has a cat named Tod. Mr Piccalilli has a cat named Millie. What happens when these cats go missing one day? A rather touching little story of two lonely chaps who love their cats (and their cake) and what happens when they're brought together when the moggies go missing. A great little twist and turn at the end ensures that this book will be read and re-read by you and your toddler. 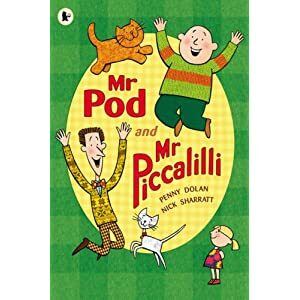 As ever, Nick Sharratt's artwork is sublime and Penny Dolan's writing is neat and full of excellent alliteration. Charlotte's best bit: Working out which members of the family would like each different type of cake. 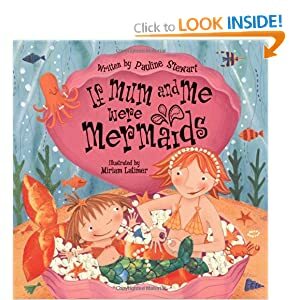 Surely at one time or another, every little girl dreams of being a mermaid, and every little girl certainly would love to be a mermaid with their mum. This bouncy rhyming book explores the undersea world and all the activities and things that a little fish-tailed toddler can see under the waves. 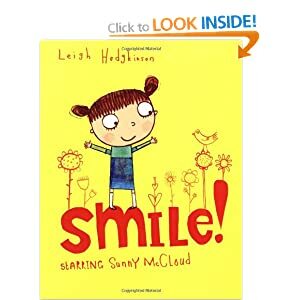 Great illustrations, cute characters and tons of detail and an engaging lilt to the text. Girls will love it to bits. Charlotte's best bit: The greedy seagull. Burp, Squawk! Television's most precocious pig starlet in book form is a more pleasant prospect than sitting through the television show. 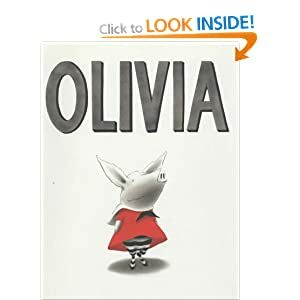 Olivia, unlike Peppa, is a pig who seems to be absolutely brilliant at everything and doesn't mind who knows it. Just once while watching the TV show you'd like to see Olivia fall flat on her face while trying to do Ballet, or end up losing out to her competitive classmate. The book's simple charcoal and gouache illustrations are neat, and though there's not really much of a storyline to speak of, it's engaging enough and Falconer's skill is to include just enough content to keep kids happy, and keep parents thinking "Yeah, my youngster does that too". Charlotte's best bit: "Move the cat"
Daddy's favourite bit: Olivia saying exactly the same thing about Jackson Pollock that Mummy said when we went to the Tate Modern recently. Sunny McCloud is normally happy go lucky, yep that's her in a nutshell. But something awful has happened. Sunny has lost her smile. This super-cute book is instantly engaging. 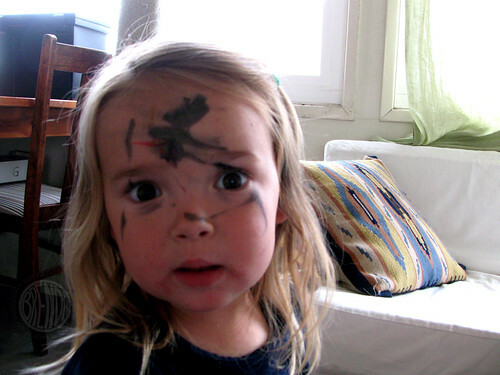 Fantastic child-like artwork (have you ever tried to draw something as a child would? It's extremely difficult, believe it or not!) helps lift the story above the norm. Sunny's flights of imaginative fancy as she searches low and high for her smile are superbly done and the book's as bright and sunny as the heroine herself, despite the poor lass spending the majority of the book in the doldrums. Daddy's favourite bit: Daddy only managing to wear a "flop" instead of the flip-flops. Sometimes, a book's artwork jumps out at you from the cover - enough to grab your attention and make you want to investigate further. 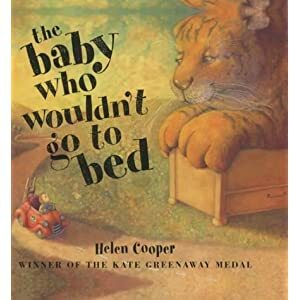 The Baby Who Wouldn't Go to Bed was one such book and Helen Cooper's sublime painted artwork continues throughout this excellent story of a disobedient little baby who just doesn't want to go to sleep. The dream-like imagery compliments Baby's story as he drives through the land trying to find playmates. Naturally everyone wants to go to sleep, not play, but Baby continues in his quest right till the end of the book. Absolutely lovely stuff. Thoroughly recommended. Charlotte's best bit: "The tiger takes batteries (he has a zip on his side)." Daddy's favourite bit: The bathroom dreamscape at the end of the book. He's lean, he's keen, he's absolutely petrified of everything outside the tree where he lives. That's Scaredy Squirrel. The book plays out like a survival manual for would-be squirrels and warns of the dangers outside the safe haven of an acorn tree. Naturally Scaredy Squirrel soon finds out that even the best contingency plans of mice and men (and squirrels) come apart like wet tissue paper when an ordinary day turns into an extraordinarily dangerous one. Great clean neat artwork and superb scurrying paranoid-squirrel text. Charlotte's best bit: Killer bees! Daddy's favourite bit: Killer bees too! 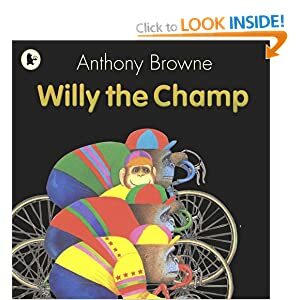 Anthony Brown's slightly neurotic but ultimately laid back Chimpanzee hero Willy is a real oddity. He's a personable little chap, he dresses nattily and always polishes his shoes - but he has no friends. That's until he (literally) runs into Hugh, a gigantic gorilla who's a big softy at heart. The rest is a tale of how Willy and Hugh's friendship builds from humble beginnings. 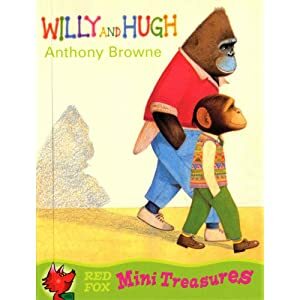 A touching tale with Browne's trademark bonkers surreal simian-flavoured artwork punctuating the very simple but effective text. Charlotte's best bit: The return of none other than Buster Nose! Daddy's favourite bit: The joggers - the picture really reminds me of an old Madness album cover. Emily Brown, space exploring hero, seafaring adventurer and schoolgirl. 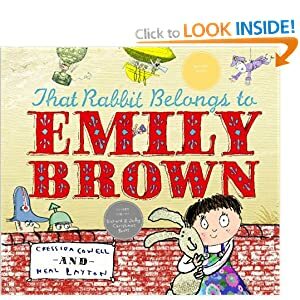 After enjoying "Emily Brown and the Thing" but being gently told off by my other half for bringing home a book with a "monster" that goes to sleep under Emily Brown's bed, I made doubly sure that "This Rabbit Belongs to Emily Brown" didn't contain anything scary or horrific. Apart, that is, from Queen Gloriana the Third's behaviour - which is downright dirty and exceptionally naughty. Emily Brown and her beloved rabbit Stanley embark on a series of adventures, constantly interrupted by the ruling monarch's repeated requests that Emily Brown gives up Stanley so that he can become the official royal plaything. As you can imagine, Emily Brown is not at all keen to lose her favourite toy. Nested between the lines is quite a neat little tale of the consequences of not always getting what you want, no matter who you are and how much money you've got. 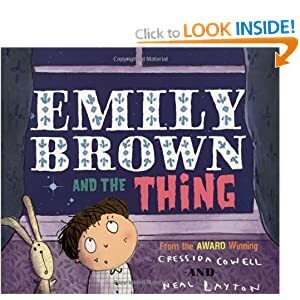 I actually prefer this to "Emily Brown and the Thing" as does Charlotte, it's slightly less disjointed but still has some excellent flights of imagination and fancy told from the perspective of a little girl. Charlotte's best bit: "Big fat pink Stanley looks sad!" We'd had this book out from the library before, long before I'd started this book blog so when we saw it again we thought we'd give it another read through. By now if you've regularly kept up with "Read it, Daddy!" you'll know that Nick Sharratt's books are favourites at Maybe Towers. 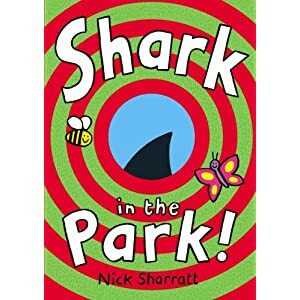 "Shark in the Park" might be quite short and fairly repetitve but the superb cutaway "circles" on each page are great surprise-reveals that children will utterly love (one slight problem with the design - kids always tend to stick their fingers through the telescope "hole" and pull the pages open that way, and this can sometimes tear the page - thankfully Charlotte's a bit more careful than some of the kids who've had the book before). A fabulously daft book, but excellent nonetheless. 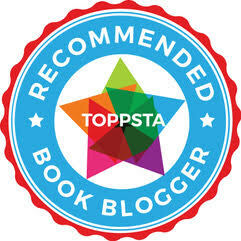 Charlotte's best bit: The reveal at the very end of the book. Daddy's favourite bit: Wishing daddy had a quiff like Timothy Pope's dad. 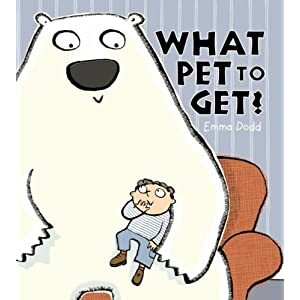 Posted by ReadItDaddy at October 08, 2010 Labels: Emma Dodd, Templar Publishing, What Pet to Get? At one point or another, every parent must dread the words "I want a pet!" coming from their child's mouth. I'm absolutely convinced that when the time comes for us, we'll end up with a scraggy moth-eaten cat which will inevitably be named "Wilbur" whether we like it or not. In Emma Dodd's book 'What Pet to Get?' a little boy weighs up the pros and cons of every possible animal from polar bears to elephants through lions through to giraffes and rhinos before deciding on something a little less exotic. Emma Dodd's artwork is big, bold and colourful and the story may be fairly unoriginal but it's executed in a neat way with a great payoff at the end. Charlotte's best bit: The crocodile, Snap Snap! Daddy's favourite bit: Mummy's super-long curly eyelashes. Great psychedelic artwork (check out some of the very weird plants growing in the background of each frame). Just when we think we've read all of the Winnie Witch books, another one crops up at our local library and we can't resist picking it up. 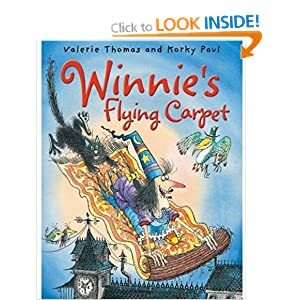 Though this is pretty formulaic Winnie Witch fare, there's plenty to keep youngsters happy and amused particularly if they're fans of Winnie's long suffering (especially in this tale) cat Wilbur. Winnie struggles to write a thank you letter (on her super duper iMac which looks suspiciously just like the one I'm typing this blog entry on) to her sisters after she receives a misbehaving flying carpet for her birthday. Naturally Wilbur falls foul of the magic rug, and ends up on a mad haphazard chase through a local fairground. As with all the Winnie Witch books, it's the illustrations that make them worth reading - oodles and oodles of detail, plenty of in-jokes (funnily enough guess who turns up making a cameo in this book like she does in all the other Winnie Witch books!) and lots to amuse children and parents alike. Daddy's favourite bit: The iMac. It must be the only one in existence that has a worse keyboard than mine. I'm never quite sure whether this book is attempting to be slightly scary, or whether it's just trying to show that parents who don't listen to or pay attention to their kids could come to a sticky end. 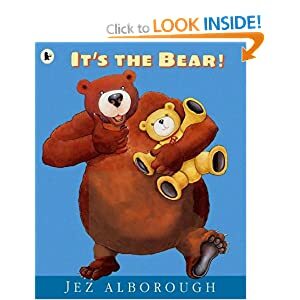 Either way, Jez Alborough's books are a delight (you've probably seen his cute chimpanzees in books like "YES!" or "HUG!". Here, a wee lad called Eddy constantly warns his mum (who looks bizarrely like Sarah Beeny from the property telly shows) about the bear that lives in the wood. Ignoring his pleas, Mum soon finds out that children should be listened to, particularly where bears are concerned. Charlotte's best bit: Eddy peeping out of the picnic basket just before being sat on by the bear. Daddy's favourite bit: Mmm! Blueberry pie! Charlotte has always wondered who the mysterious "Doctor Lady" was when she previously had cameo appearances in most of the Winnie Witch books. The answer is the marvellous amazing Professor Puffendorf, a mad scientist with as many crazy inventions as Winnie Witch's spells. This is the first time we've seen any of the Prof Puffendorf books at the library so we had a look and I think we'll be on the lookout for more in the series as it's excellent stuff. 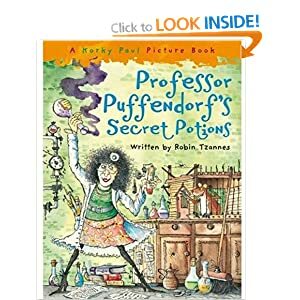 In this cautionary tale of what happens if you're a nasty dishonest hired help, the Professor's cleaner steals several amazing secret potions, testing them out on Professor Puffendorf's hapless hamster before attempting to make off with them. Naturally the thief gets his comeuppance at the end of the book with hilarious consequences. As a massive fan of Korky Paul's artwork there's his trademark of scratchy pen work with absolute tons of detail on show in this story. We can't wait to read more. Thoroughly recommended if you're fed up with Winnie and her misfiring spells. Charlotte's best bit: Professor Puffendorf's hamster singing. Daddy's favourite bit: Trying to decipher those bizarre cyrillic messages Korky Paul leaves throughout his work. Emily Brown and her rabbit Stanley can't get to sleep (I know the feeling, I've had insomnia all week). The root cause of their sleepless nights is "The Thing", a friendly monster who sends Emily and Stanley on a series of quests to help HIM sleep. If you've read "This Rabbit Belongs to Emily Brown" you'll know what to expect - an imaginative mix of adventures and haphazard happenings. I'm not always convinced by Neal Layton's illustrations in this (they're a bit scrappy, and hit and miss) but the storytelling wins through and even though he's a right royal pain in the papoose, you can't help but feel sorry for The Thing. Daddy's favourite bit: Poor Thing being reduced to tears when told off. Our local Library (the Malthouse Library in Abingdon, Oxfordshire) has been a favourite haunt of ours for a few years now, even before Charlotte was born. Spread across two floors, the majority of the ground floor is taken up by a massive children's section going from baby books right through to teenage stuff. Thankfully there are hundreds of toddler books to choose from and so far we've managed to avoid being stuck for something to read. The library's staff are always friendly and helpful, and on wednesdays (which I fortunately get to spend with Charlotte) they run a couple of nursery rhyme singing groups, dishing out noisy instruments so that babies and toddlers can sing along and join in making a glorious racket. The library also has a pretty huge fish tank (with very few fish left in it, alas) and plenty of comfortable seating and toys to keep little ones occupied. We're extremely lucky to have such a valuable resource so close to home. Normally "What do you do all day?" is the sort of thing your boss will ask you, normally when you've got a teetering in-tray and have been trying to beat an unreasonable deadline. 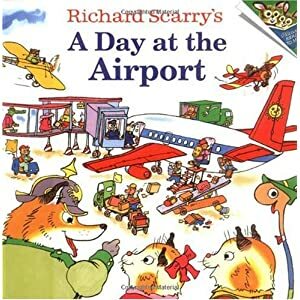 Following on from the Richard Scarry love-in of "A day at the Airport" we're back in Busy Town for a huge, detail-packed toddle through Busy Town's exceptionally busy folk. Every job you can think of is packed into the book. We see firemen, coal miners, bakers, butchers (does anyone else find it worrying that Busy Town's butchers are pigs, and are usually found in the book lovingly fondling sausages?) all in Scarry's trademark cartoon detailed genius. Though there's no real narrative thread running through the book (something that caused my daughter to constantly shout "Read it, read it, read it!" when I spent more time pointing out the crazy antics than reading the text) it's still fantastic if you've got enough of an imagination to make up little stories about each colourful and detailed page. Daddy's favourite bit: I still can't shake the image of that piggy butcher and his sausages. 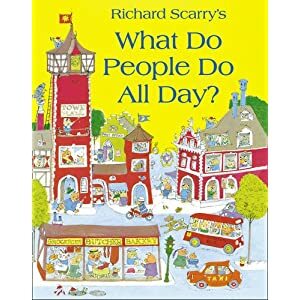 Finding an old Richard Scarry book at the in-laws recently, I remembered how I got a huge "Busytown" book for christmas when I was a kid, and how that book was read, and pawed and basically trashed over the space of a few years because it was so well loved. So much to look at and such a brilliantly daft story and setup. Definitely worth the asking price. Writing a sequel to one of the most well received and best loved modern classic children's books must've been a daunting task. I half expected "The Gruffalo's Child" to be a bit of a miss with Charlotte but it seems she actually prefers the antics of the Gruffalo's mischievous daughter more than she enjoyed the original book. Possibly because she identifies more with the toddler Gruffalo and her antics. Ignoring her dad's advice (common behaviour for daughters, so it seems), The Gruffalo Child ventures into the deep dark wood in search of the scary and terrible mouse. 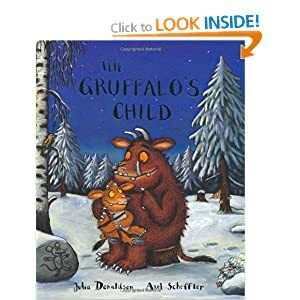 The rest plays out in the trademark perfect rhyming couplets Donaldson is famous for, and of course Axel Schiffler's illustrations are as superb as they were in the original Gruffalo book. One thing crosses my mind though. The mouse really could do with knocking down a peg or two. Anyone with me in hoping that the next Gruffalo book features the mouse between two slices of bread on page one? Daddy's favourite bit: Mouse's near squeak with being a dinner, again. I rather haphazardly put something together in Blogger and keep meaning to tidy things up a bit so if anyone has any suggestions for changes or what this blog needs / doesn't need, let me know (though there's no need to write them in indelible ink across your face, just drop a comment in the box below). My wife refuses to read these books as they're written, swiftly changing the slightly schoolboy-tittersome "Willy" for Wilemina. My brother took one look at the swimming pool scene in this particular Willy book and said "Wait, what? These books are for kids, right?" but regardless, Charlotte loves this cheeky and cheerful little chimp and his antics. What is Willy good at? What does Willy excel at? Is there more to Willy than a colourful sweater and a winning smile? Find out in this tale with its Browne trademark of surreal painted illustrations mixed with simple but engaging text. Daddy's favourite bit: A nice little homage to Marilyn Monroe and Rene Magritte on the same page. Oh and the fact that Buster Nose wears a loo chain around his neck! I kept mistyping this one as "Mog in the Dog" which might've made for a mildly more entertaining read than "Mog in the Fog". I am at the mercy of Charlotte who always seems to have a habit of finding the Meg and Mog books in the library, even though I try my best to steer her away from them. This is standard Meg and Mog fare. Meg and Mog go on a trip (always leaving Owl at home, what DOES Owl get up to while they're away eh?). Mog gets into trouble. Meg casts a spell, possibly causing more trouble, Meg and Mog fly home. In fact the odd thing is, you could pretty much cut and paste the text from Meg's Mummy straight into this book and I doubt anyone would notice. Charlotte loves 'em though so like the dutiful dad I keep getting them and reading them to her. Charlotte's best bit: "What's that daddy? What's a Yeti?" More Little Princess antics and a story that'll have more than a ring of familiarity about it for any of you who have toddlers and are expecting a new baby. The Little Princess has her own ideas about what should happen when Mummy and Daddy plan new offspring. 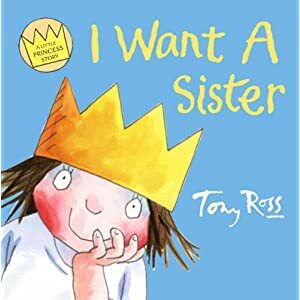 "I Want a Sister" might feel a bit predictable and formulaic but for fans of the Channel 5 "Little Princess" series, Ross's books never disappoint and there are some great running gags peppered through this story if you keep an eye open. Charlotte's best bit: The cat with a glove on his head. Daddy's favourite bit: The running gag with the cat "leaving home"
The superb writing / illustration team of Julia Donaldson and Axel Scheffler can do no wrong. Bringing us the deliciously dark tales of the Gruffalo, they've turned out hit after hit book and the Acorn Wood series is no exception. 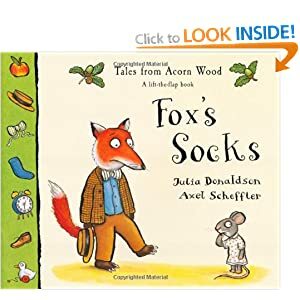 This simple tale of a fox and his missing socks may look familiar if you've already read through "The Gruffalo" but the addition of lift-the-flap searching for poor old Fox's missing footwear means that children automatically engage with the book and its simple poetic text. Can't get enough of Axel Scheffler's artwork. Brilliant stuff.